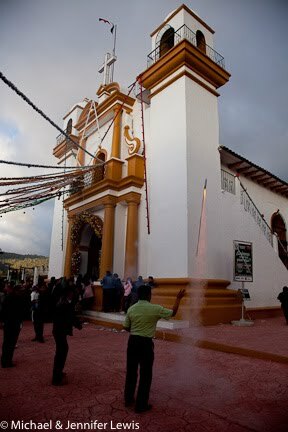 One of the attractions of a Spanish class in San Cristóbal, Chiapas during the first two weeks of December was the celebration for the Virgin de Guadalupe. 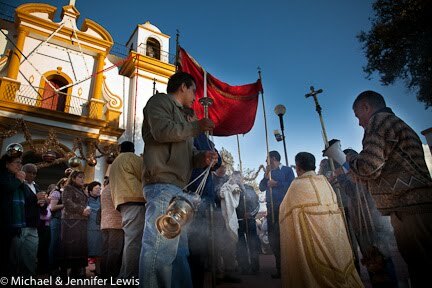 The fiesta runs from December 1 – 12, and, we were told, would feature many events, including processions of indigenous people going to the Iglesia de Guadalupe. 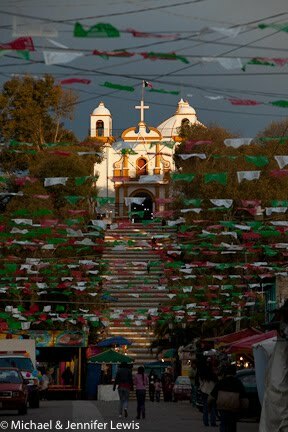 The church, which was begun in 1834, has a commanding location on a hilltop to the east of the historic center. The story of the Virgin de Guadalupe is an important part of Mexican history. Her appearance to an indigenous peasant, Juan Diego, in 1531, and her subsequent image on his cloak created the legend. Thus began a religious symbol that has seen the Virgin become, in many ways, more revered by Mexican Catholics than Jesus. Mexican novelist Octavio Paz wrote that “the Mexican people, after more than two centuries of experiments, have faith only in the Virgin de Guadalupe and the National Lottery”. In addition to the hundreds of local church members who make the daily walk up the steep steps to the church, are thousands who come from the surrounding towns to pay tribute to or seek blessings from the statue of the Virgin inside this church. Indigenous people, young and old, make up a significant number of people visiting the hilltop. Many of them run and walk from their villages, some barefoot, carrying torches and banners to show their devotion. Everything was remarkably unscheduled. Our classes and our favorite cafe were both on Real de Guadalupe, which is a pedestrian mall for several blocks and leads to the church from the zócalo. At any moment, honking horns, chanting, or blaring trumpets would announce the procession of a group from Palenque or Tuxtla or San Juan Chamula. It could be teens in t-shirts with the Virgin on the front, Aztec dancers, or Tzotzils in traditional dress. At times, it felt more like a pep rally or a political group chanting slogans. But like much of life here, religion isn’t always quiet and polite, it is, at times, noisy and showy. 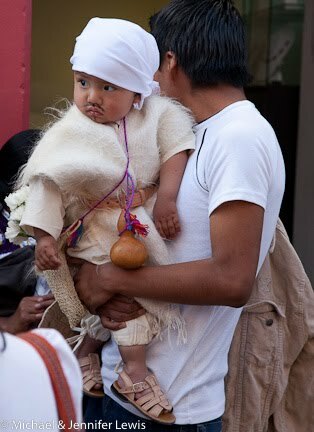 On Friday, two days before the day of the Virgin (December 12), parents dress their boys up in peasant clothes and paint on mustaches to honor Juan Diego, who was made a saint in 2002. Little girls are dressed in different native dresses. A procession on the Real de Guadalupe to the church is led by the parachicos, a traditional dancing group from Chiapa de Corzo. 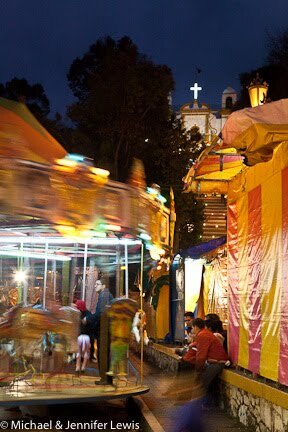 The streets at the foot of the steps fill with food stands, children’s rides and other merchants, providing a carnival atmosphere to the celebration. Surrounding the church, the presence of parents and children brings out the balloon and ice cream vendors and the fiesta feels like it has reached critical mass. Through the week as each group approaches the church, one or two of the men are in charge of sending rockets into the air. Unfortunately, they aren’t the kind that create a visual show when they explode. They are simply, really loud. Which means there use isn’t limited to evening hours. So, for two weeks and twenty hours per day, it sounds like the city is under artillery attack. You can see more complete coverage of the festival in a private gallery on my web site. If you don’t have the password, send an email to me and I’ll provide it.